Why Don't the British Like Israel? True, Jews are deeply integrated into British society and have felt secure for decades. But incidents of antisemitic violence have been escalating and even notables like the Jewish director of television of the BBC have expressed fear about the future of Jews in the country. Antisemitism, interwoven and often indistinguishable from anti-Zionism, has reemerged full force. New statistics on antisemitic incidents prove that the British climate is changing for the worse. Why the animosity against Israel, which extends from the political left to the right, and across all social classes? Four sources may be suggested, each with roots in the 20th century. The British Establishment arguably never recovered from the loss of the Empire. First, the British Establishment, comprised of elite schools and universities, government and idea setting industries like the media, arguably never recovered from the loss of the Empire. This should not be understood as a lament for the Empire so much as the manner in which it was lost, and for what the upper classes have come to believe should have been the outcome. Britain won World War II but quickly lost the peace. Bankrupt, Britain was only preserved by an enormous loan in 1946 from the United States. Britain's most important colony, India, became independent in 1947 and promptly split with Pakistan at the cost of hundreds of thousands of lives and tens of millions of refugees. But it was Palestine, which at its peak was garrisoned by 100,000 British soldiers unable to keep the peace, which rankled most. Losing the empire was bad enough, but losing Palestine to the Jews was a unique humiliation. Zionist anti-British violence, above all the destruction of the King David Hotel, resonated strongly for decades. It is also only now being understood that the British establishment had fought a covert war for decades against France in Syria and Lebanon, and had encouraged Arab states to invade the infant State of Israel. This strategy also backfired, helping usher in revolutionary regimes that overthrew British allies and reducing British influence still further. These multiple failures embittered the British Establishment for decades. 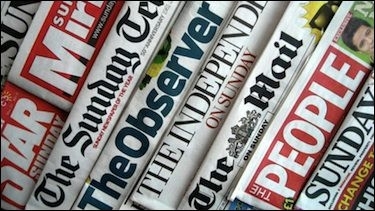 The British media focuses relentlessly on alleged Israeli wrongdoing. More recently, however, a wave of politically correct guilt has swept over the British Establishment. In this revisionist view the British Empire, unlike any other empire over the preceding 5000 years, was a singular source of evil in the world, and the impact in Palestine, uniquely so. In this view, Britain's contradictory promises to Arabs and Jews, alleged favoritism towards Zionism and repression of local Arabs, and the British role in maintaining an international system that has permitted Israel to exist, are deep wrongs, yet to be righted. Little wonder that the BBC and British media focus relentlessly on Israeli wrongdoing, real and imagined, while glossing over those of its neighbors. In contrast, the British attitude toward Palestinians is marked by expressions of guilt and patronizing behavior. 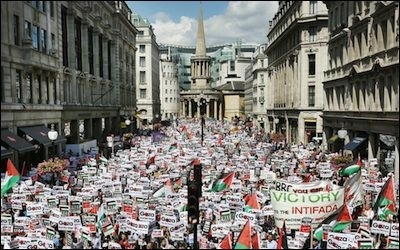 The labor movement has become one of the centers of virulent anti-Israel bias in Britain. A second reason for current British attitudes is the gradual conversion of the British labor movement to the Palestinian cause. Until the 1960s the British labor movement saw Israel as a fellow socialist state with anti-imperialist leanings. But in the wake of the 1967 and 1982 wars Israeli success (and alignment with the United States) became increasingly unpalatable to a labor movement that could only see Jews as underdogs or victims. Coupled with an orientation towards the Soviet worldview, implacably anti-Israel and pro-Arab, that grew from the 1960s onward, the labor movement has become one of the centers of virulent anti-Israel bias in Britain. The dramatic changes in British Christianity must be counted as a third cause. Jews like to point to British Christian Zionism, but in truth this was a spent force even before the Balfour Declaration in 1917. Indeed, Anglicanism is deeply supersessionist and regards Judaism as retrograde, a community forsaken by God. Anglicanism is deeply supersessionist and regards Judaism as retrograde, a community forsaken by God. Though the Anglican Church has been in steep decline in recent decades, it has been reinvigorated in part by Palestinian Christians who have reinvented traditional Christian antisemitism, converting Israelis into Romans and themselves into the new Jews. The impact of this old/new Anglican theology is seen in the degree to which the church, like the labor movement, leads the BDS movement in Britain. Finally, there is the role of Muslims in the United Kingdom. Until the early 21st century Muslims were a small minority. Now, in part thanks to the Labour Party's covert strategy of encouraging immigration under Tony Blair, including from backwards places like Pakistan, precisely to change the demographic and electoral composition of Britain, Muslims number around 5% of the total population. Muslims in Britain are at the forefront of antisemitic agitation in Britain and maintain a dizzying network of organizations to support BDS and the Palestinian and Islamist causes. There are few reasons to think that Israel's position will become more favorable with Britons or other Europeans in the future. Ever increasing Muslim populations alone appear to ensure that political establishments will adopt voter-friendly anti-Israeli rhetoric and policies. And while local anti-Muslim sentiment is at an all-time high, the Establishment remains intent on repressing this officially through speech and thought codes, and unofficially, by denying such voices media access and legitimacy. The media in particular remains intent on making Israel the villain, regardless of the issue. The rise of local independence movements that threaten the United Kingdom will also likely increase pro-Palestinian sentiment, since at least some of these (such as the Scottish National Party) have anti-imperialist sentiments and compete for immigrant voters. Record trade relations between Israel and Britain are one bright spot. But with BDS calls expanding in Britain there should be few expectations that trade will continue without several challenges. Britain struggles to define itself in the 21st century – as a European or Atlantic state, as a multicultural or British society. In the end, Israel's continued belief in its own religious and national identities, and the vigor with which it defends itself, may be too much like the Britain of old for today's British to regard with much favor.